I find myself standing in the turbulent storms of people’s lives. Feeling into their stories, trying to help them uncover some truth, or divine the high road to clarity. Sometimes my mind, and spirit tingle with heavy and oppressive energies that surround them. As if there is a stranger in the room. You know… That hot honey feeling that pours over you, creeping into all the secret spots making you feel strangely exposed. When my awareness hones in on that kind of intruder I know there is more happening under the surface. So we tread cautiously, little black cats slinking into the night. This energy smells of abuse (of any variety)… The toxic sludge of an energy parasite. Someone is taking advantage here, trying to get a little more than their share. Energy vampires who hide in the light of “normal” lives. That is exactly how the reading began. On the other side of the line a woman spoke. She wanted to see where Spirit would take me… Not wanting to control the session. As soon as she spoke I knew she was wanting answers, but more importantly she was wanting freedom. First, she talked about career, and money and wanting to start something on her own. But I knew she was asking questions between her questions. A silent longing hung over the conversation… Because really she was asking how to escape a toxic relationship. I knew it immediately by the heavy cloud veiling her aura. As the story unfolded the energy become darker, and more menacing. Two people coexisting. One with the power, and the other with the pain. My heart breaks for mothers who have to sacrifice their light to keep their children safe. But this woman was strong… And I wanted to make sure she knew it! We talked for awhile about what she could do next. I saw a few allies she had not yet recognized. And, we uncovered some mysteries that seemed to be haunting her mind. But more importantly we talked about how she could gather her strength for the wellbeing of her children, and herself. Even in those silent, desperate moments a light can be found. Power can be summoned. Magic can be made. We have all stood in the circle of fear, of one kind or another. Taunted and provoked by that looming thing… Be it a person, a situation or pure imagination. That feeling is all too real, and all too intimidating. I remind myself in these moments that I am a being of light. Within my small, human self, lives a mighty force, a blazing lantern of Spirit energy…. Ready to ward off the wolves at the edge of the woods. Sometimes you can’t muster that kind of courage, and light and you need an ally. Something larger, greater and more resilient to step in and help combat the pain. In those moments I remember my Spirit Circle… The collective of celestial beings that surround me. Not only do you have your very own Spirit Circle, but you have access to powerful, cosmic beings like the Archangels. Archangel Michael specifically, “he who is like God”, the powerful protector angel who works throughout the Universe answering prayers for those in need. Let me be clear these beautiful, divine beings are not relegated to one religion, nor do you have to believe in anything specific to call on their aid. They are channels of pure intention created like all the other natural wonders in the cosmos to help those in need. The Archangels are pure creations of the Creative Unknown channeled into a specific vibration for us to call upon when we need grace. Archangel Michael is a powerful divine force who shows up big in the Universe. He is an energy of love, compassion and protection. Available to anyone in need, he will come when called and stand at your side… Carrying you through the most tumultuous storms of your life. There is no task to small or great when working with this divine expression. When I call upon Michael he appears to me as a handsome man. Tall, athletic with a chiseled jaw and dark wavy hair. Dare I say that he is very handsome! Covered in blazing armor and glowing with an aura of violet light. He carries a flaming sword of truth to cut away danger and fear. His eyes are deep, warm and inviting. A bright light emanates from his chest reminding me that he is an expression of love and compassion. Angles are expressions of energy, unlike you or me, they have no real body. They appear to us in a way that makes sense. Sometimes they take the form of something familiar to the collective unconscious, and other times they will take on a form that seems to speak to our spiritual and poetic senses. However you perceive this expression of Spirit will be right for you! When you are caught in the currents of low vibrating feelings such as trauma, despair, fear, anger or depression. Anytime you are feeling off kilter, or under the weather Michael will be at your side. When you are in a dangerous or tumultuous situation. Be it physical, mental, emotional or spiritual you can fortify yourself against the pain through the help of Michael. This is especially true in uncomfortable situations where you are being abused, taken advantage of or made to feel less than. When you are dealing with heavy feelings or locked in a mental pattern. This could be a difficult decision where you can’t seem to take a stance. This could be a situation of addiction or reoccurring illness. When you are experiencing restlessness, night terrors or insomnia. Usually there is an underlying issue which need to be resolved. Calling upon Michael will help you get to the root cause and begin to work through it. When you are under psychic attach, or dealing with an energy vampire!! Or working through the tangles of depleting psychic chords. As a powerful force of Divine grace, Archangel Michael can be invoked for just about anything. He can mediate between you, and your spirit circle putting you in-touch with whomever/whatever you need to smooth and heal. He protects, defends and holds sacred space for those seeking to live their highest good (your divine right). Find a private space where you can feel safe and vulnerable to connect with the Divine. In this space you may want to gather a soft pillow and blanket. Loosen your clothes. Get comfortable. Support your back and body for mediation. Wrap yourself in a blanket lightly. When you are ready, begin by closing your eyes and focusing on your breathing. Once you feel grounded and settled turn your attention inward. See and feel in your inner eye a beautiful space that evokes feelings of the magic. A night garden filled with luscious blooms. A beautiful cathedral cascading with rainbow light. Or a simple sitting room with fluffy, inviting chairs. Whatever this space looks and feels like to you is perfect. Make yourself at home in this sacred space. Take in the sight, the sounds, the scents. Explore a little if you like. Take note of anything that stands out to you. Be present in the space… Don’t force anything… Just observe where you are and how you feel. Now take a seat somewhere comfortable within this sacred space. Cast out your awareness beyond yourself. Your senses tingle with a euphoric feeling of love and comfort. Softly chant… Archangel Michael, Archangel Michael, Archangel Michael. You are sending out your signal to Archangel Michael letting him know you are in need. 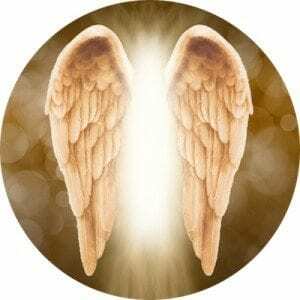 How does Archangel Michael appear to you? Can you see him? Feel him? Maybe you just know he is there? Maybe he comes as a figure… Or a beam of light… Or some other shape that seems to wrap you in feelings of safety. When you have made the connection begin to express to Michael what is troubling you. Tell him your story. What makes you feel heavy, hurt or unsafe? What do you need protection and shelter from. Let Michael know how he can best help you. Once you have told your story, and expressed your sincere prayer let the energy settle. Just be with that feeling of release. You have revealed your heart, become vulnerable in the light of divine love. How does it feel to get this off your chest? Open yourself to Michaels love, protection and wisdom. Listen intently… Does Michael have a message for you? A suggestion on some action you can take in the physical world? Maybe he gifts you with a symbol of protection? Or a word to speak when you need shelter? Whatever comes next will be Divinely guided. Again, do not force anything… Just be with it. Even if nothing comes, know that Michael is now working behind the scenes on your behalf. Express your gratitude to Michael for gathering with you. When you are ready begin to focus on your breathing. See the space around you start to turn fuzzy until it fades away and you come back to the room. Be with this energy whenever you need it. Work through this mediation daily if you like. Or simply recall the feelings of being in that sacred space. That sanctuary is a place that lives in your inner world… You can return anytime to meet with your Spirit Circle. Archangel Michael I call upon you, and your band of protector mercy. Please, wrap me in your protection. Release me from the hold of limiting energetic patterns. Help me move into my purest expression of Divine grace. So shall it be. If I am dealing with a particularly stressful situation I will light a candle to Archangel Michael. You can find beautiful glasses incased Novena candles used specially for prayer’s to Archangel Michael. These candles can be found at most religious novelty stores, and have an image of Michael printed on the glass. These candles are usually burned for 9 days in a row, at the same time with a specific prayer, or intention in mind. Carrying a piece of Sugilite will help you connect with Archangel Michael, and the other members of your spirit circle. This is a lovely purple stone that helps to remove blocked energies returning your energy body to a more fluid state. 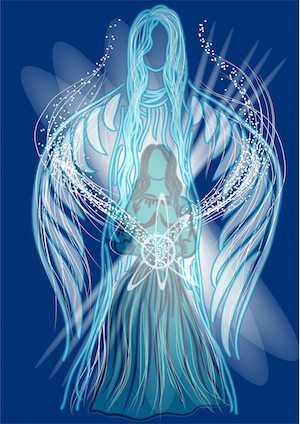 It raises your vibration to help you better hear the voice, and receive the guidance of the Angels. Keep this stone in your pocket and when you are in need of help, hold it and focus on your intention. Keep an image or medallion of Archangel Michael with you as a amulet and a reminder of the help and protection that is at your disposal. You can say a prayer or affirmation over this amulet, and even dab it with a little Frankincense oil to bless it with higher vibration. Tuck it in your pocket, wear it on your body, or place it in your handbag. Remember, you don’t have to do it all alone. Ask for help when you need it. Your Spirit Circle, and Divine helpers are here for you when you need them. You have to invite them in, and ask for their aid. They cannot interfere with your life path unless you invite them in. Make your journey a little lighter by using all the love that has been given to you in the Universe. 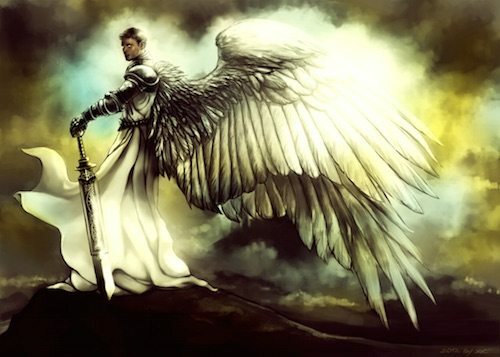 Image of Archangel Michael by GuiltyFox.